Canadian Wildlife Federation: I’m worried about the animals outside. It’s absolutely freezing in my town. How are they even surviving? 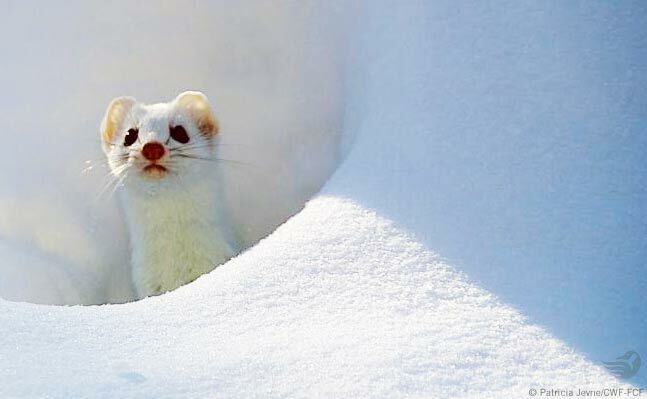 Small mammals like mice, voles and shrews tunnel through the snow when the temperature dips. And thanks to snow’s insulating properties, this subnivean zone feels like it’s 0 °C, regardless of the cold temperatures and blowing winds above. The fur of snow shoe hares turns white in preparation for winter. This helps both with camouflage and warmth. Their feet are also heavily furred in the winter and this helps them move around in deep snow. A deer’s winter coat consists of hollow hair shafts and wool-like underfur that has great insulating properties. They also congregate into larger groups and tend to move to sheltered areas where they benefit from less snow. Using the same trails also allows for easier access to food sources and helps them flee from predators. When old man winter comes a calling, these little birds eat 20 times more than they do in the summer. They also have the ability to lower their body temperature by entering a controlled hypothermia, which gives them the ability to conserve energy. They shiver and can also fluff out their feathers to trap air to keep warm. Squirrels have longer and thicker fur in the winter and their tail can be laid against their back for extra protection. Several squirrels will also share a tree den to conserve heat. So don’t worry too much about your friends outside this winter. Keep your birdfeeders stocked up and enjoy their company.